Madge and Dorothy are arguing over the stud muffin that is Harold(!) Dorothy denies sending a rose and suggests Madge calms down. MADGE: Rest in peace is exactly what you're gonna do if you make any more passes at Harold. Harold is reassuring Gemma that she is welcome there and that she should call him ‘Uncle Harold' rather than Mr Bishop. Madge is still hot headed about Dorothy. 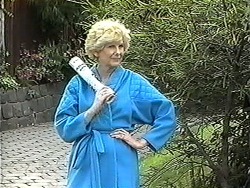 DOROTHY: If she gets around dressed like that no wonder Harold's got a roving eye. 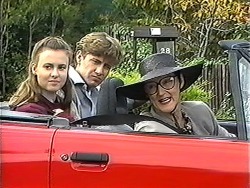 After a bit of pleading by Ryan, they give Gemma a lift to school in a surprisingly sporty convertible when Dorothy takes a dig at Madge. DOROTHY: Good morning Madge, I do think hair curlers would really set off that dressing gown. Todd really wants to make it to Josh's birthday party and begs his aunt for permission. She relents and lets him off his grounding for one night only. Cody thinks Bev looks sick. Josh arrives and informs the group that he can't have a birthday party because of the Lassiter's fiasco. The teens are gutted. Mel is desperate to do some PR work so Paul hands her a contact file which he wants bringing up to date. Mel is upset it isn't actually PR work but resolves to impress Paul. Harold wishes Madge didn't cause such a fuss with Dorothy as she had the wrong end of the stick - Eddy sent the rose. MADGE: Eddy? What does he think he's doing giving you a rose!? Harold implores Madge to apologise. Matt comes in and is about to go when Mel begs him to stay as she really wants to talk to a friend. She bumped into Calvin and she hadn't seen him since the brasserie. Roger is returning from New Zealand soon - he's been writing romantic postcards. He suggests that they give the teenagers a birthday meal at theirs, he only wishes he could come up with a better idea. Gemma needs to find the local library so Ryan offers her the chance to see Erinsborough by bike but she's never learned to ride a bike before. He offers to teach her. Mel is very excited about impressing Paul with her PR skills. Dot apologises for going along with the prank but Harold says he knew all along. Harold says that since Todd is grounded he shouldn't be there so they relent and say they'll go when Matt comes in and tells them Mel's thought of a great idea for his birthday. They need to get very dressed up and meet at Mrs Burke's house for their first clue - it will be a scavenger hunt. Ryan should start up a service of teaching kids to ride a bike as Gemma has been taught in the blink of an eye and she's off. Harold tells Paul he is pleased with the effort Mel is putting into the directory. Bev and Jim are still having problems and Paul comments that Jim has been behaving strangely lately. Bev wants to know what he means. Mel thinks a complementary drink voucher is a good idea as it will make the business people buy more and she suggests they should offer secretarial services to guests. She thinks that to offset the guests taking the complimentary toiletries they should set them out in a basket to take home as the cost will be minimal and they will return because they feel special. Paul is very impressed at her foresight. 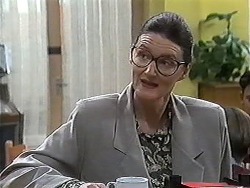 Bev wants a word with Paul, she wants to know what Paul meant about Jim's behaviour being strange. She reminds him that although he doesn't like her, Jim and her haven't talked about divorce so it isn't a permanent split. He suggests that she tells this to Jim. 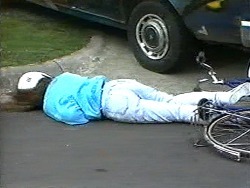 In her speedily acquired biking skills, Gemma has to sneak the bike back as Dorothy is home early. 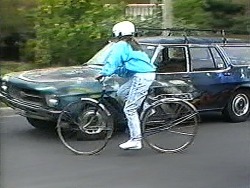 She wobbles and forces Matt's car to swerve and hit a post box as she bumps into the back of the car and falls off.